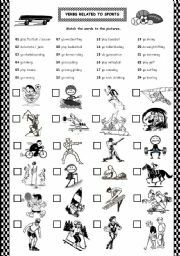 Sts have to match the pictures to the verbs. Since it was not possible to send another sheet with the answer key, I listed the suggested answers (some verbs are interchangeable) at the comments page. Thanks for understanding that!!! 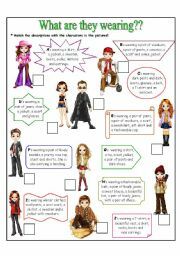 This is a lovely activity to be used with many purposes; such as the present continuous, clothing, singular, plural, physical descriptions, seasons of the year, etc... besides it is a pretty fashionable activity!! Your students will love that!! 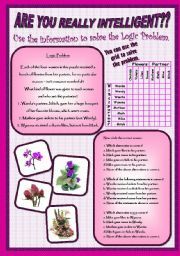 This is a pretty nice activity that makes students think a little bit more to get the necessary information in order to complete the table. It is a smart way to work with the famous Verb To Be. I used it with my 7th and 8th graders. They got really interested in solving the puzzle. Hope you like that too!! Bye!! 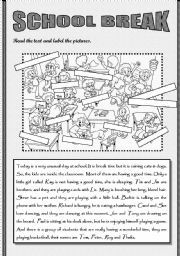 Ss have to read the text and label the pictures. I hope you enjoy the activity. Greetings from Brazil. 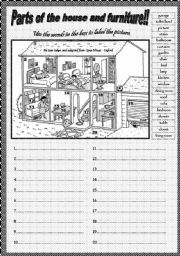 This is a pretty good activity for students to practice at the same time, the use of the verb To Be, articles, singular and plural, jobs and personal pronouns. From A to Z, students have to check the correct alternative. 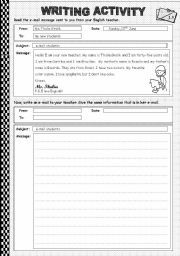 This is a 3 page test I used with my 6th graders. 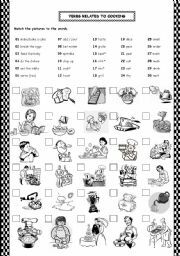 There is a great variety of activities/questions with a reading comprehension text, and questions related to foods and drinks, quantifiers, etc... I hope it can help you!!! Thanks a lot!!! Hello!!! 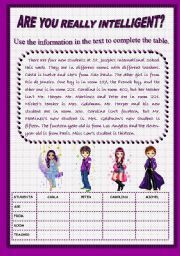 This is a presentation that shows the use of Will - Future; there are examples of each case. I hope you like it!!! Thanks for stopping by!!! Hello there!!! This is a presentation to work pieces of clothes and some accessorizes, along with the structure: He/ She is wearing... My sts got the dolls and they prepared their own presentation, their job was awesome!!! I hope it helps you somehow. Thanks a lot for stopping by!!! This is a pretty nice presentation with "Special Effects" that teachers might use it to introduce the First Conditional along with the use of Will (probable result in the future) & Should (to give pieces of advice to people). This is a presentation to work the WH question word WHO, along with physical descriptions (eyes and hair), it can be used to talk about clothes, colors, even the simple present - HAS. I had to separate it in two parts, sorry... I hope it helps you in some way!!! Thanks for stopping by!!! 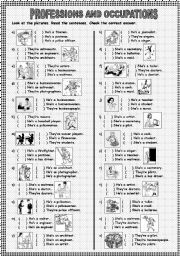 THIS IS A VERY NICE TOOL TO TEACH THE POSSESSIVE PRONOUNS. HOPE YOU’LL LIKE IT..!! ASK YOUR STUDENTS TO PRODUCE THEIR OWN PRESENTATIONS USING THIS ONE AS AN EXAMPLE. I DID THAT AND MY STUDENTS PRESENTATIONS WERE WONDERFUL! Hello everybody! This is a nice presentation to improve our sts vocabulary. There are two examples of each adjective and its opposite. Hope you like it! Thanks for stopping by!! !